Are you dealing with a drafty detached garage this winter? Making upgrades and improvements to detached garages is often on the bottom of most homeowners’ DIY project lists, but a little winterization can totally transform a chilly detached garage into a perfect climate controlled space. If you are sick of getting into a freezing cold car every morning, or shivering while utilizing the workspace in your detached garage, try some of these winterization ideas. With just a little work, and a lot of insulation, your garage will be cool in the summer, warm in the winter, and comfortable year round. Unless your detached garage is relatively new, your windows are likely the biggest culprits of letting heat escape from your space. As time passes, the wood around the doors and windows of your garage warps, creating spaces for air to pass through. If windows and doors are not sealed and insulated properly, heating the space is nearly impossible. Experts recommend a two part approach to combatting drafty windows. Step one is to caulk the outside of the windows. Second, use weatherstripping to seal the windows from the inside. Start by using a stiff-blade putty knife to remove peeling paint and old caulk from the outside edges of your windows. Next, use a brush or sponge with warm water and soap to clean up any dirt and dust around the windows. Afterwards, be sure to wipe all of the surfaces dry with a clean towel or cloth. Once all of your windows are cleaned and clear of any leftover caulk, apply new caulk on the outside edges of the windows. The caulk will seal the space between the siding of your garage and the window frame, preventing air from passing through in either direction. There are many different caulks available to choose from, but consider using a siliconized acrylic caulk or a 100 percent silicone sealant. Both of those options will remain flexible and sturdy for years after being applied. Once the outside of your windows are accounted for, it is time to move inside. To completely winterize your windows, use some type of weatherstripping to seal them. The goal here is to seal the sashes, which are the moving parts of your windows that open and close. Like caulk, there are many different types of weatherstripping available depending on your needs. Below are a few of the most commonly used types. Adhesive-backed foam: This commonly used type of weatherstripping uses foam to seal the gaps of your windows and keep drafts out. Once purchased, simply use scissors to cut strips of the foam to fit your windows, and stick them where they are needed. The foam will compress around your window as you close it, creating a winter proof seal to keep cold air out. Remember to clean the area thoroughly before apply the foam, as the adhesive does not stick very well to dirty surfaces. Rubber Weatherstripping: Rubber weatherstripping products work very similarly to foam products. Instead of having the window compress into foam to make a seal, rubber weatherstripping products have a hollow rubber tube that the window fits into when closed. Some rubber weatherstripping products come with adhesive and can simply be stuck in place, while others may require nails or screws to keep them secure. Felt: Felt is one of the oldest and most commonly used weatherstripping products. Felt is often sold in rolls with adhesive backing, meaning it can be easily stuck to any drafty areas. Felt is an affordable option, but it usually does not last as long as other weatherstripping products, so it will likely need to be replaced every few years. Window Insulation Kits: Window insulation kits use sheets of shrink-wrap plastic to completely seal entire windows. The plastic film is stuck to the inside of the window frame with double sided tape, and then heated with a hairdryer to shrink the film into place and remove any wrinkles. Window insulation kits are extremely effective, but remember that once installed the window cannot be opened or closed again until springtime when the plastic is removed. Once your windows are sealed properly, it is time to focus on your garage door. Newer garage doors frequently come with spaces built in to hold insulation, so fiberglass insulation can simply be purchased and cut to fit into the door. For older doors, try using polystyrene foam panels. These panels often come ready to match the size of your panels on your garage door, but the foam can also be easily cut to match any door as needed. Be sure that the panels are the right size for your door, then glue them in place using contact cement. By winterizing your garage door and windows, your garage, detached or not, will be much more habitable this winter. 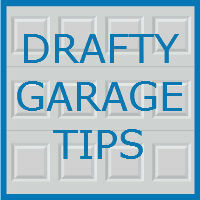 For other garage related tips, ideas, and DIY projects, be sure to follow our Sky Writers Garage blog. At Blue Sky Builders, our team of garage enthusiasts is available to assist you with any garage project you may be undertaking. Visit Blue Sky Builders online or call 630-852-8485 to get started today.